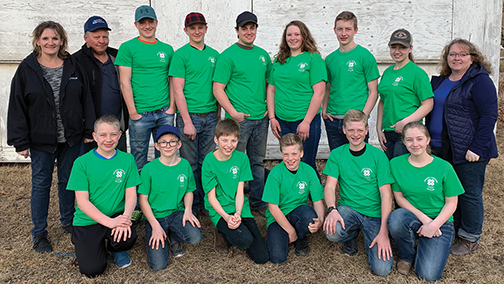 Eight out of 12 Kinuso Lakeside 4H members have been involved for four to nine years, which is much longer than the average. The average 4H member participates for two-and-a-half years, according to president Janaya Klassen (17) and general leader Edie Klassen. “We share a passion for animals and raising meat animals, and teaching the younger generations” Madison Conrad (17) says as her reason for the high percentage of long-term members. In her sixth year of 4H, she is district representative for Kinuso. 4H accepts members from age nine to 21. Kinuso’s members vary in age from 10 to 18. Many attend as families. “The club gets along very well. They laugh a lot,” Kristen Mason, assistant general manager, says. Several members describe 4H in their own words. 4H is a “thing where you’re in with a steer you raise nicely,” Malachi Loewen (11), historian, says. 4H is “something where you learn stuff. Learn public speaking and get to know new people,” Josh Loewen (14), treasurer, says. Aged out, in his first year as beef leader, Liam Mason was a member of 4H for 10 years. Like most organizations, 4H has various positions. New members Malachi Loewen (11) and Shadrach Loewen (10) are historians. Historians “collect pictures and make a photo album of events and fun stuff,” Malachi says. Club reporters “keep people up to date on Facebook and everything,” Trae Klassen (13), club reporter, says. Club events include fund raisers, public speaking, cattle shows, and fun events. The district fun day was on April 6. It was Nerf wars hosted by the Slave Lake Northern Lights 4H. The district has four clubs – High Prairie, Smith, Slave Lake, and Kinuso. Public speaking is a key component of 4H along with animal husbandry. Kinuso members all raise beef cattle. “The hardest part is having to feed your animal constantly,” Summer Mason (14) says.